At a time when some politicians still do not take the problem of climate change seriously, it’s exciting to read a book that takes solutions to climate change seriously. 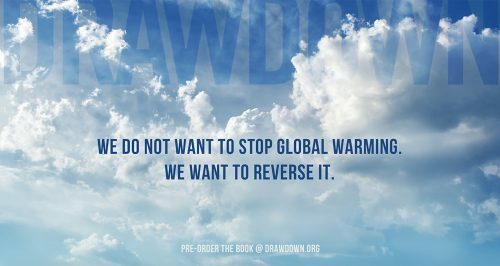 Drawdown, edited by Paul Hawken, is the most comprehensive attempt ever to measure and model how we begin to reduce greenhouse gas emissions to reverse global warming. Project Drawdown identifies the 100 most substantive solutions already existing or underway today that can roll back global warming within 30 years. Reverse global warming? Within 30 years? That sounds incredible. As a ‘Drawdown Advisor,’ I couldn’t help but question the claim. I mean, the IPCC Fifth Assessment Report discusses ways that we can slow or limit global warming, but reverse it? Paul’s reply was that they were looking not only at emissions reductions, but at a wide range of changes in land use (23 solutions) that take up or sequester carbon from the atmosphere. These represent “no regrets” solutions that provide numerous other benefits as well, such as for crop yields, human health, biodiversity, income and employment. Drawdown estimates the emissions reduction potential for each solution (number of gigatons of carbon dioxide removed from the atmosphere), and calculates the net costs and net savings. The solutions are ranked according to the total amount of greenhouse gases they can avoid or remove from the atmosphere. The top five solutions, whose order vary according to the scenario, include refrigerant management, wind turbines (onshore), reduced food waste, plant-rich diets, and tropical forests. There are 95 other solutions, each a fascinating story of possibility and impact, backed by research and numbers. Every one of them is do-able. Not all of the solutions are technical or managerial. Educating girls is ranked #6 — it is closely linked to managing reproductive health and to building resilience in terms of climate change impacts. Both of these will have dramatic effects on global warming. The calculated return on investments in educating girls is simply incalculable. The three scenarios presented in the book (Plausible, Drawdown and Optimal) and are based on the latest research, but like all scenarios they include some uncertainties, such as the impacts of ocean, land, or methane sinks. While it might be tempting for climate scientists to dismiss positive scenarios as “unrealistic,” there is good reason to take Drawdown seriously. These 100 solutions have been thoroughly researched, and they can make all the difference in the world when it comes to reducing the impacts of climate change. Given what is at stake, overachieving on the Paris Agreement is a goal worth striving for, to say the least. Most of the solutions described in Drawdown are already here. Take bamboo, a fast growing grass that is so strong that it can be used in almost every aspect of buildings, including plumbing. The carbon stored in bamboo’s silica structures can sequester carbon for hundreds or thousands of years. As a material, it can replace high emissions products such as plastics, steel, concrete, aluminum, and cotton. And it is highly efficient at producing pulp for paper. Drawdown is not naïve – there is no doubt that bamboo is an invasive species that can threaten native ecosystems, and the ecological impacts of vast monocultures are widely recognized. However, cultivating bamboo on degraded lands alone, especially with steep slopes or significant erosion, could add an additional 37 million acres to the 77 million acres cultivated today. This would be at an estimated cost of USD 23.8 billion, yet would yield net savings of USD 264.8 billion. Impressive. Drawdown also provides glimpses of upcoming attractions, such as smart highways, industrial hemp, marine permaculture, and bulding with wood. It includes inspiring essays and excerpts, ranging from “The Hidden Life of Trees” by Peter Wohlleben to one from Pope Francis’ Laudato Si. In an essay on “Reciprocity,” Janine Benyus, co-founder of the Biomimicry Institute, suggests that “To help reverse global warming, we will need to step into the flow of the carbon cycle in new ways, stopping our excessive exhale of carbon dioxide and encouraging the widened ecosystems of the planet to take a good long inhale as they heal” (p. 215). Drawdown is not just a project – it is an adventure. It is promising story that has the potential to engage every person on the planet with at least one solution to climate change, whether it is educating girls, improved rice cultivation, creating walkable cities, eating a plant-rich diet, household recycling, or any of the other solutions. But inspiring individual action is not the main objective here. In fact, Hawken reminds us that the very idea that we exist as isolated beings is a myth: “We are all intricate, interconnected parts of complex social structures and cultures, and more broadly of the entire web of life – the ultimate source of water, food, fiber, medicines, inspiration, beauty, art, and joy” (p. 216). Drawdown is an excellent read for people who might be sitting at the edge of their seats, waiting for some form of confirmation that the United States will maintain its commitment to the Paris Agreement. The book contains so much important data and information that it is tempting to conclude that politics are irrelevant, since the solutions are right in front of us. But politics do matter, and “drawdown” will not happen unless people actively and collectively engage with the solutions. Drawdown crunches the numbers and reveals what is possible, but it is up to people and politics to make it happen. Next time you hear news about the melting of ice sheets, sea level rise and flooding, the loss of coral reefs, drought and hunger, the spread of vector-borne diseases, or changes in the Arctic, and think to yourself “game over,” remember the message from Drawdown. Reversing global warming is possible. Game on!